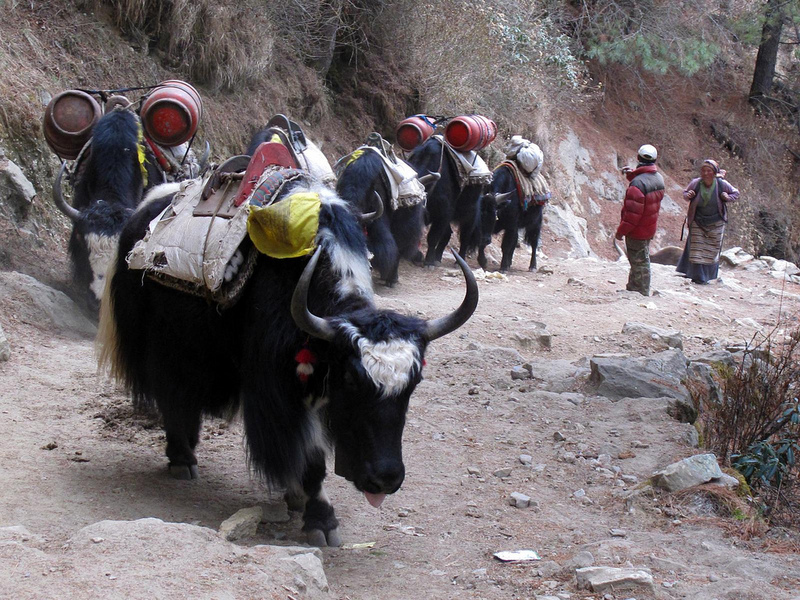 Besides just being awesome, yaks are also tremendously useful. Without them life on the Tibetan plateau would have been nearly impossible for most, and even Buddhists in the region are an exception to the vegetarian rule and eat yak meat. Without the consumption of animals in their diets, like the Inuit who also live in very cold environments lacking vegetation, they would have long since starved to death or died of malnutrition. In this land of scarcity all of the animal was used and treasured. 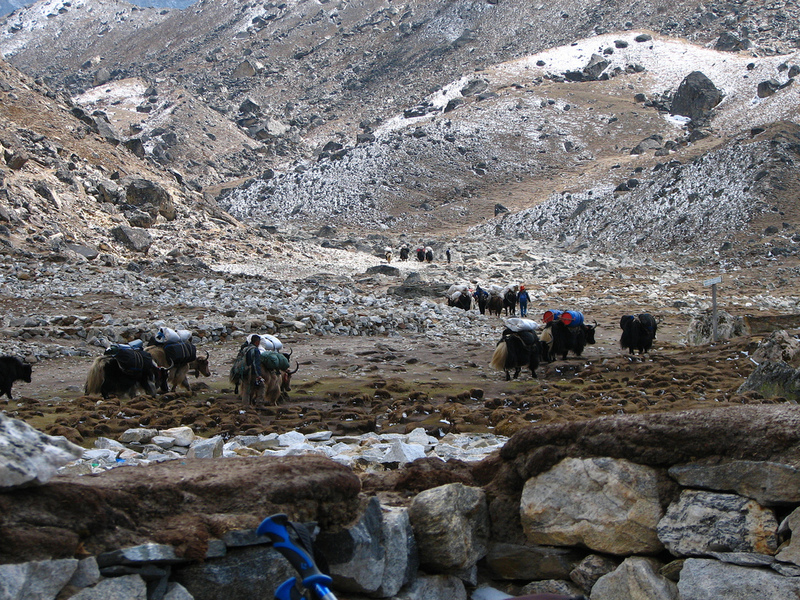 The hair and hide provided clothes and cordage, and the horns and bones of yaks were utilized in a multitude of ways to provide long lasting tools and adornments. 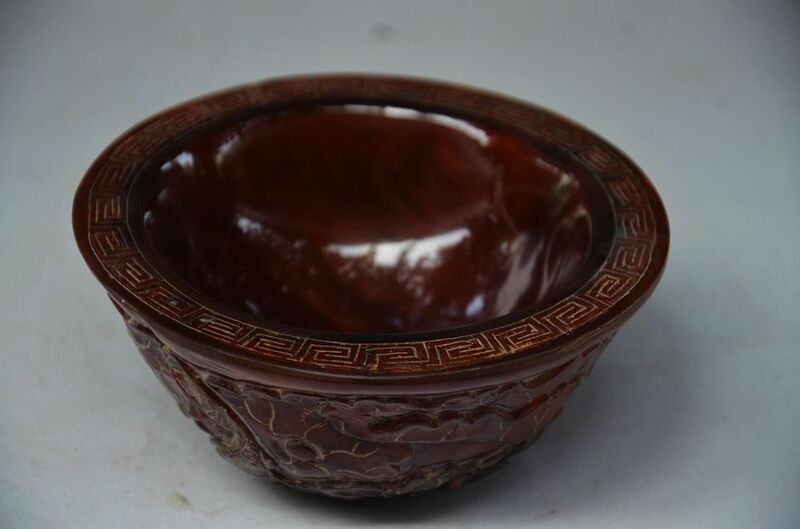 Cups and bowls are quite common, often with scenes of pine forests or lotuses. It is interesting to note that unlike tribes in the Pacific Northwest, there aren’t many large spoons made from horn, indicating the lack of large feasts, meanwhile there are numerous little cups and pen containers. Life was hard apparently, not a lot of food, but a lot of tea and thinking to make you feel less hungry. 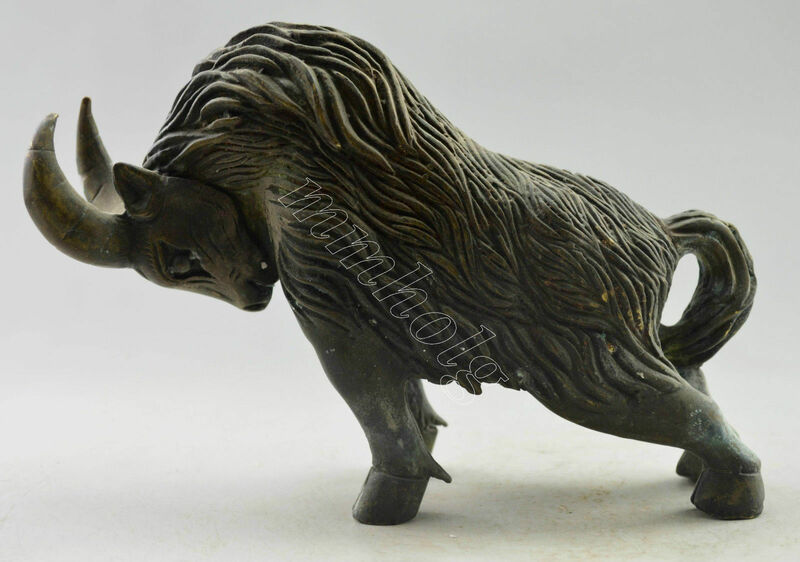 It is very questionable sometimes whether the horn material is yak or ox or even some other animal like rhino, but here are common examples currently for sale on Ebay. Many would have been family heirlooms for generations, and may have been owned by both Chinese and Tibetan families. 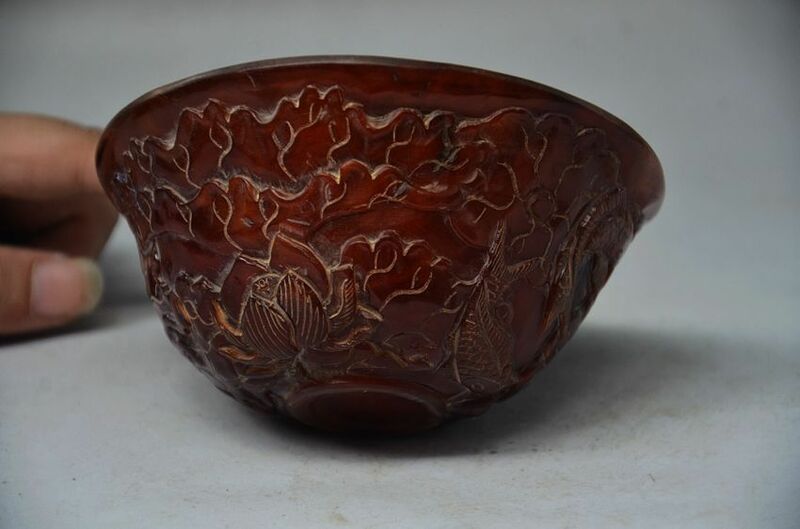 Fish and lotus designs on these sized cups are very, very popular throughout the ages, symbolizing divine beauty and purity, well being and fruitfulness. 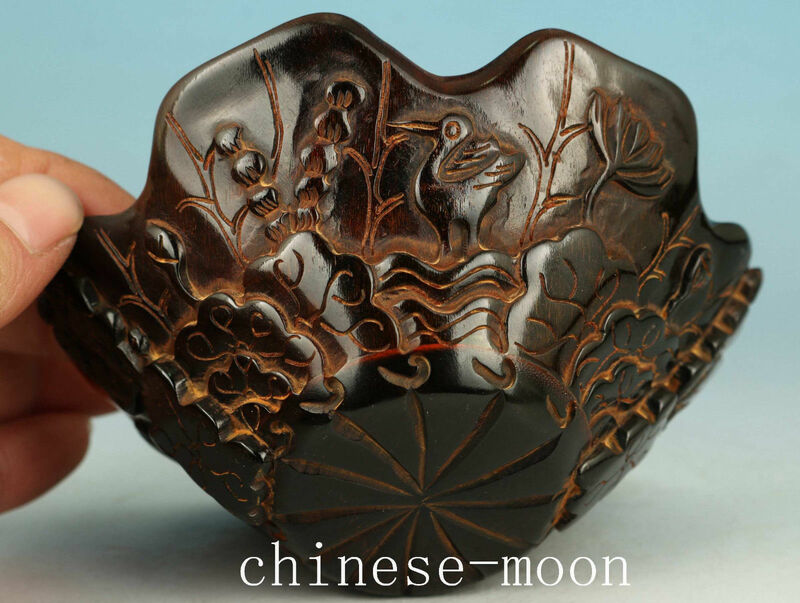 The horn bowl above features lotuses, and fish with birds- specifically carp and cranes. Far more ornate are some of the carvings which undoubtedly would have been prized possessions of the nobility of Tibet (and China), who were greatly dispossessed of all their worldly possessions by the communists who are selling it here today. These are not new but family heirlooms that span back hundreds if not thousands of years, and have ceremonial and religious significance in many cases. 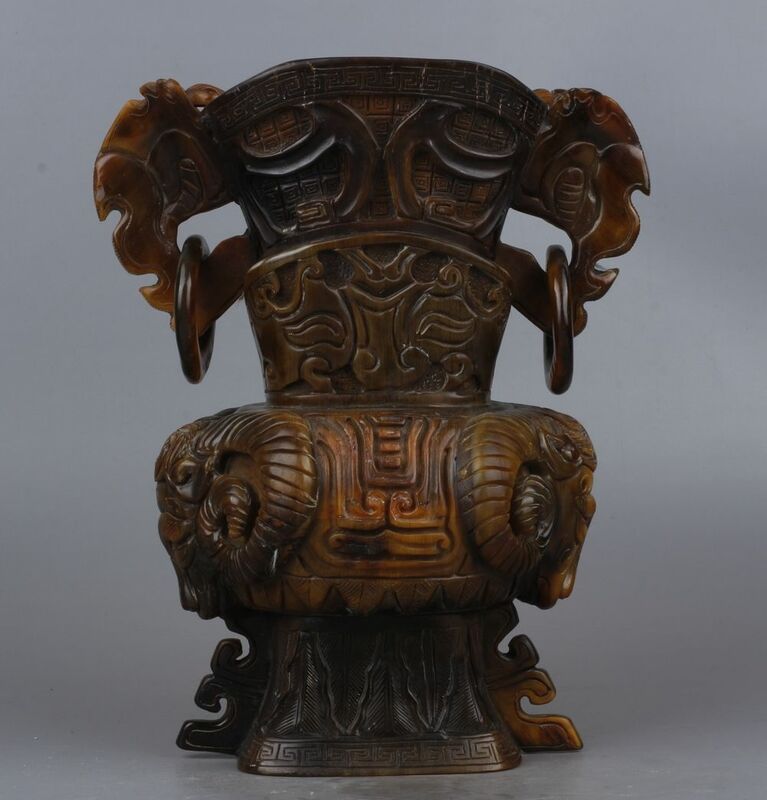 This is a ceremonial vessel called a jué which was used for drinking warm wine (horn is very heat resistant), and either modeled after Chinese bronzes during the same time period (1,60o+ years ago), or a forerunner of them and if from Tibet, exemplify cultural influence and exchange between the aristocrats of China and Tibet that predate any modern prejudices, as well as show that these people weren’t just tribal people from the back woods who didn’t know anything and have any high culture and history of their own. 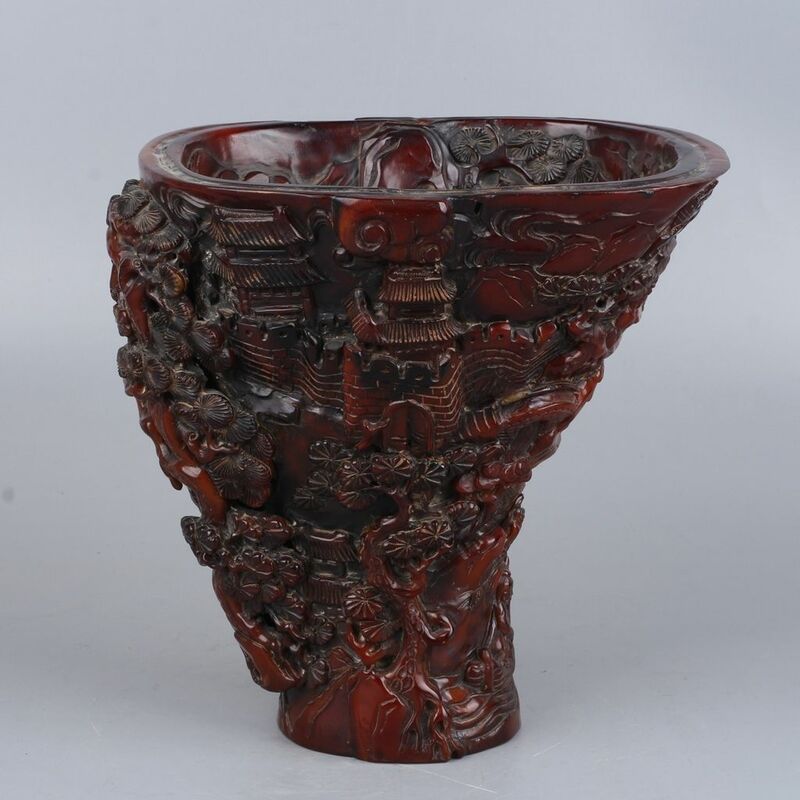 As you can see, this three legged ceremonial cup which looks suspiciously like an ancient Chinese one is being sold in a shop called tibetan-shop99 which adds to the body of evidence supporting the theory these have artifacts have robbed from Tibet, and aren’t Chinese at all. The Chinese even today are wonderful at copying other people’s art, and may have done so in the past multiple times, which may be part of how dragons and pixius were born. I suspect these mythological “Chinese” creatures may have started out to be very real dogs and tigers, but people copying the designs didn’t know what they were copying, and over time they became further and further distorted from reality. Something like the sheep vase above would have been very expensive and made for ritual purposes, and perhaps specifically as a grave good for a very wealthy owner. 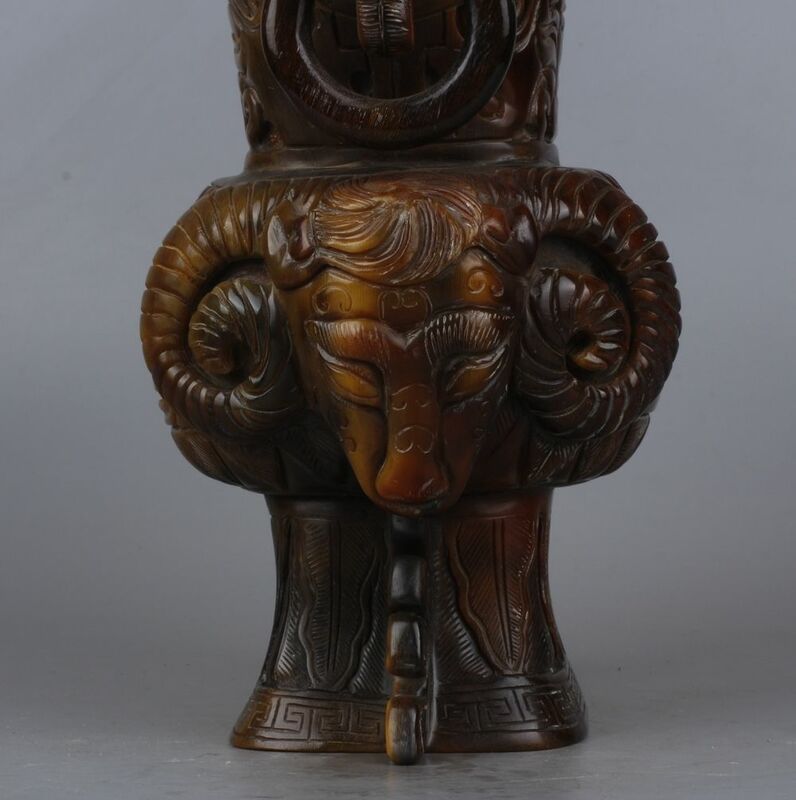 This type of vase is called a four goat square zun which is typical from the Shang Dynasty dating from 1558 to 1046 BC; what is not typical is that it is carved entirely from horn which has also been steamed and molded to this specific form, usually they made from bronze. 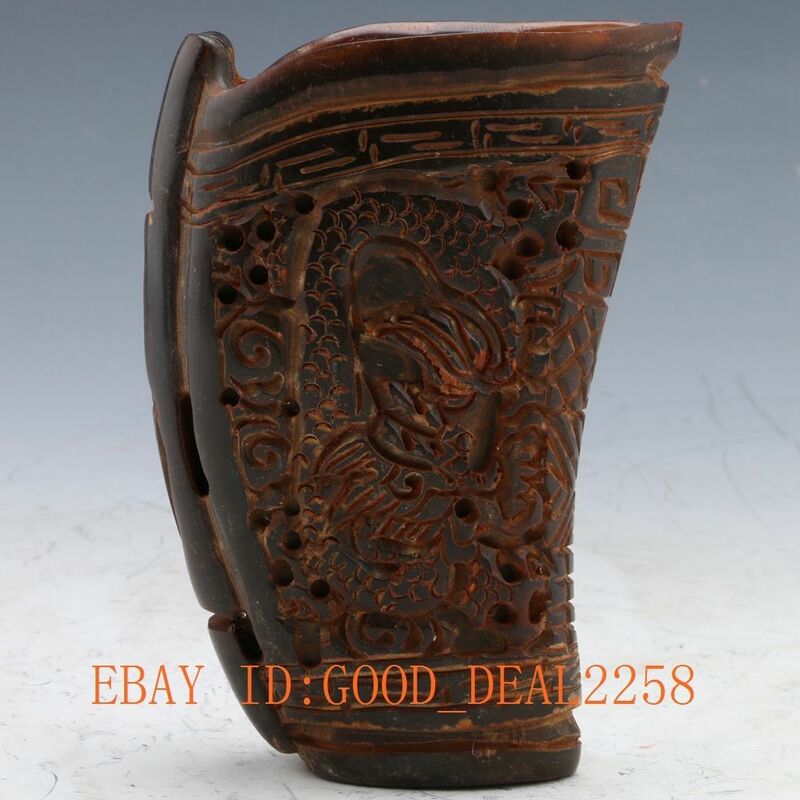 Something like this really should be a national treasure and never leave China, but here it is being sold on Ebay with a starting bid of $0.22. The phoenix and dragon cup below may have been owned by the emperor or royal court at the time, and should have once again never been sold on the open market, but preserved in a museum. Is it Tibetan? Is it Chinese? Hard to say, since both symbols are used by them as well as the key border- the geometric design, however the Chinese are very, very good at copying others art even today. The evidence of who invented what and who copied who is perhaps why the Chinese are so keen on selling off these items. 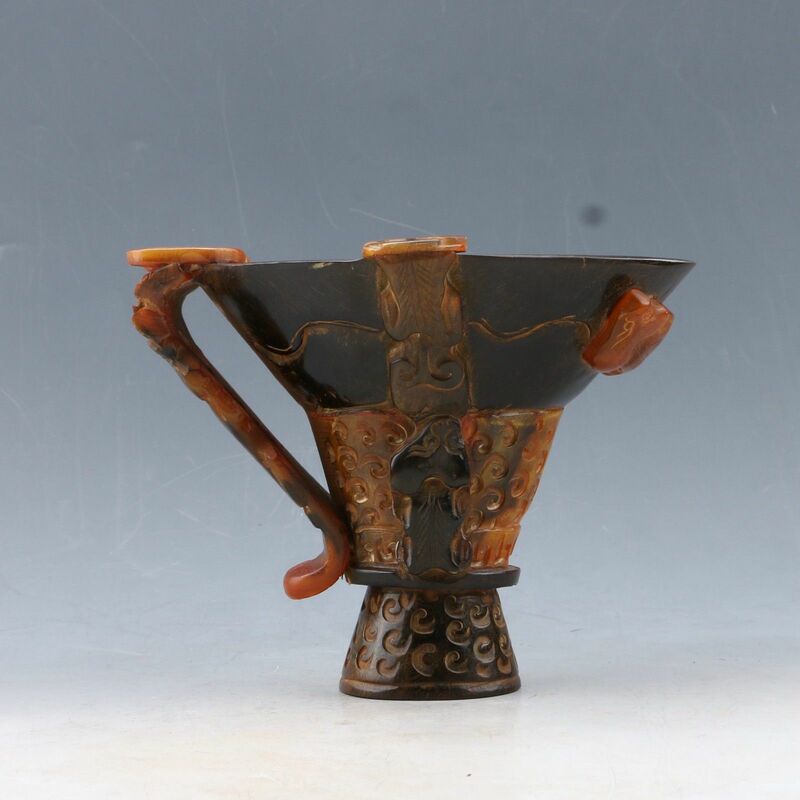 This cup is very impressive and points to a highly cultured past which involved social hierarchies beyond what is typically included in the Tibetan historical narrative today. 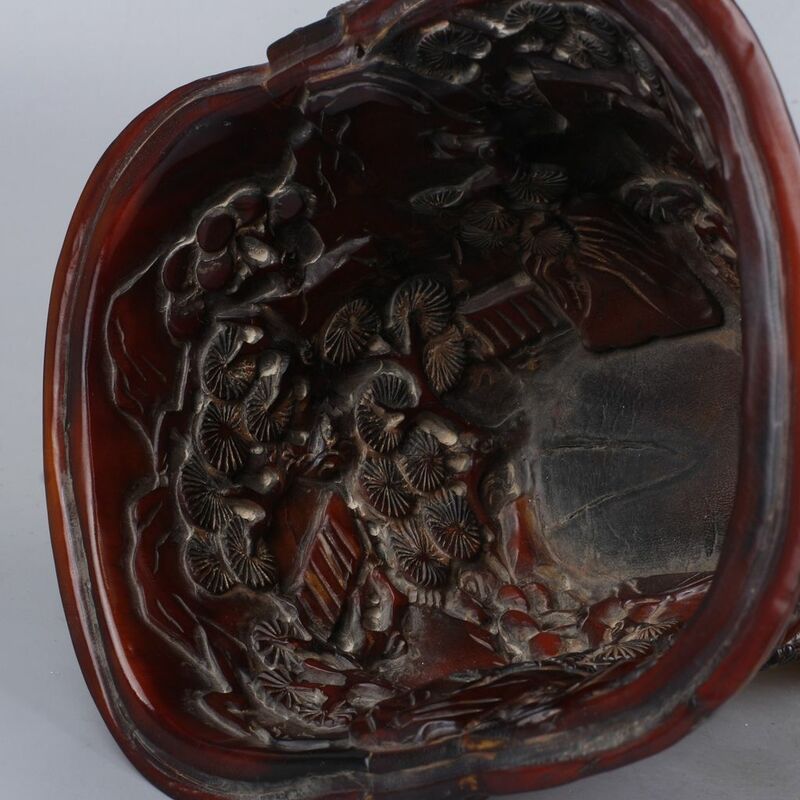 18 Arhats beads with Guanyin at the end made from either yak, cattle or even rhino horn. The cracking apparent on the surface is due to great age. Not bone but relatively newer and made from a resin. 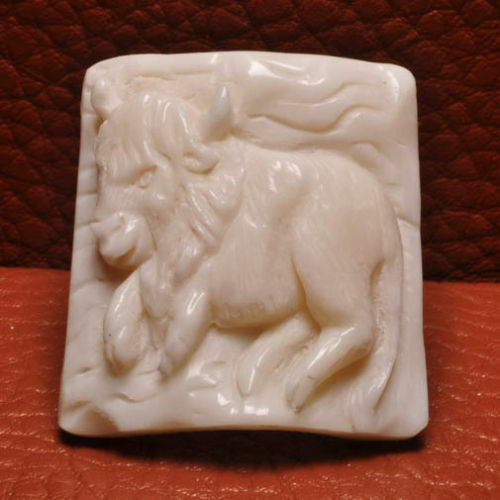 Chinese sellers say that they are made from powdered yak bones, but I don’t know if this is correct or not. Being sold as “new without tags” though when these pendants are all used- the scratches you can see with the naked eye, sometimes even the cord itself has been used before- the wax coating comes off and threads start to fray, easily seen with a hand lens. Made from agate using the same techniques as dzi beads, yaks are very rare. Tw very rare yak dzi beads (show above) showed up for sale at the exact same time, and if you notice the stand in the photos, it is exactly the same. This is clearly the same person with two different shops. It might make sense if you just wanted to open a new shop because you had reached your $30,000 Ebay limit on the other one, or to sell different things in a different shop, but having two shops selling the same things? guzhuojingjing5 currently has a feedback of only 35, and zhangjunlongv5 has a feedback score of 21- these are based upon how many sales are made. If the person was really there to make money, they would have only opened up one shop and their feedback score would have increased more rapid, allowing thier buyers to bid with greater confidence in them quicker, and thereby making more money. 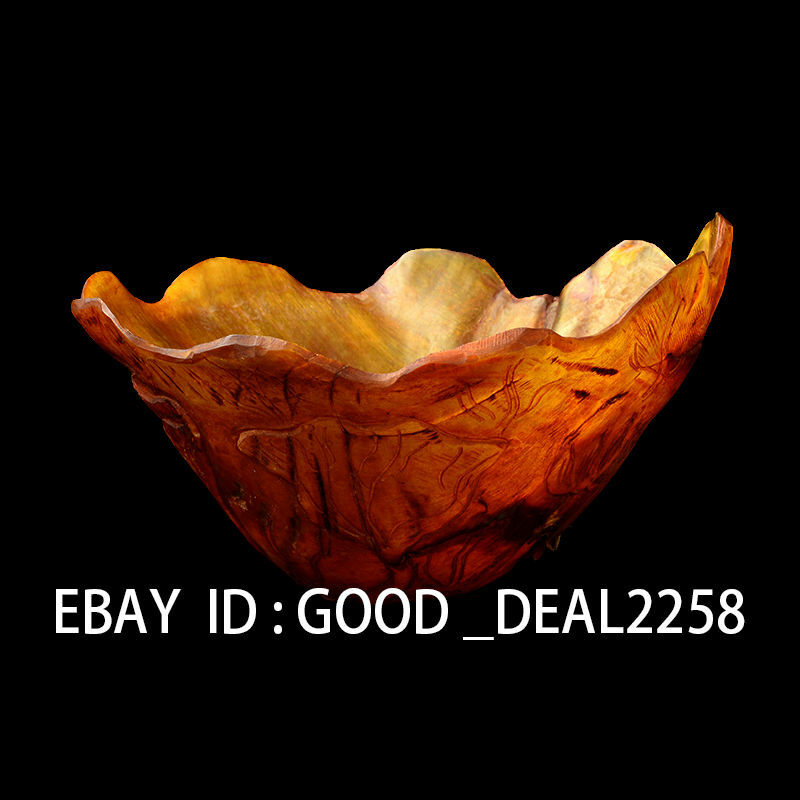 Another odd thing about these new Chinese Ebay shops that appear, is that Ebay typically places a limit on what you can purchase from new sellers. Yet time and time again, there isn’t any limits for even brand new Chinese sellers without any feedback scores, because they are already trusted sellers by the Ebay system, with other shops already set up. It creates the illusion that there are many sellers and that things aren’t really rare or unique in many ways, and devalues the items being sold by having them be sold by sellers who look like they have just started. 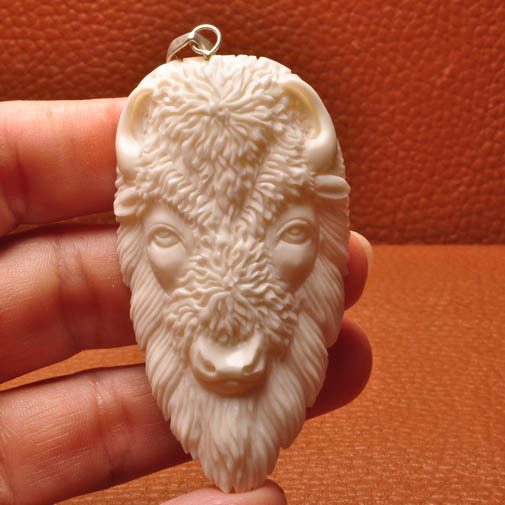 Though the seller says this is “bison”- it is a yak. Similarly they call Tibetans “Indians” all the time., though there is quite a remarkable resemblance between the two, its not quite the same thing. 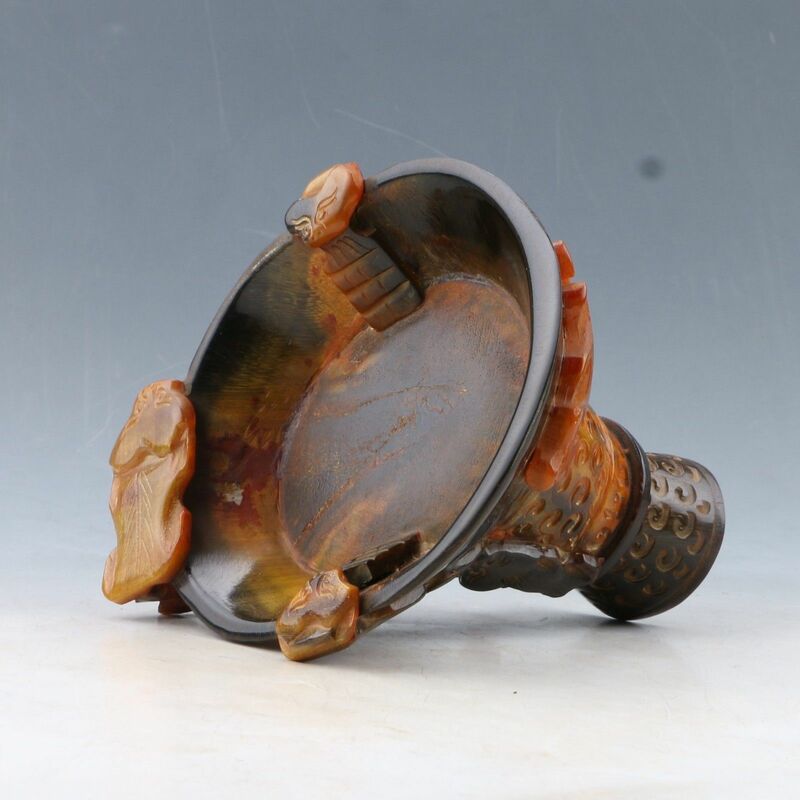 Though almost all of the items the Chinese Ebay sellers are selling are used, they have varying degrees of wear, staining and age as you can see by comparing the pendant- still being sold as brand new- below with the one above. 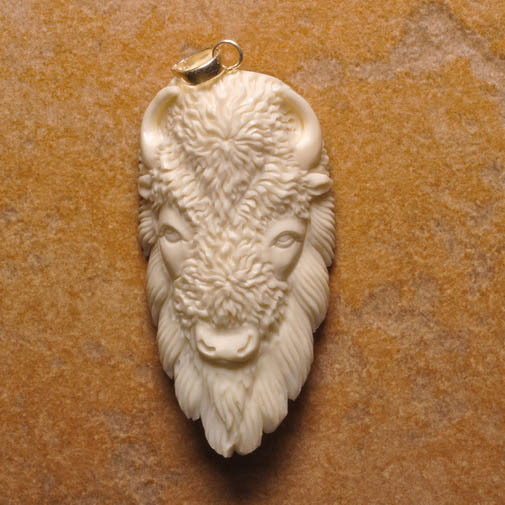 There are 4 similar shops just in the US selling the exact same items including these very fine bone carvings. In these very same shops are beads and jewelry, all used, all Chinese and/or Tibetan in origin it looks like. Though I tried to get these shops to tell the truth about their items to customers, the only thing leaving feedback saying their items did was get me banned from their shops. I tried to leave a criticism about this with the Better Business Bureau, I figured since one was called “Bead of America” that they would be taxpaying businesses that were registered in the United States, but it turns out they aren’t, and there is no record of any of these so called “American” businesses at the BBB. None of them. Which means they probably aren’t paying any business taxes too? The scary thing is that the Tibetan items in the stock of these shops are not limited to these numerous bone pendants, but it seems to be all their stock. Each one of these four shops carries 15- 18 thousand items at any given time, and have sold some 10 million things according to the bar codes they’ve got consecutively numbered between the 4 (or more) American shops alone. I fear many 1,000’s and 1000’s of the old Buddhist prayer beads whose string had rotten away (and other sacred and rare beads undoubtedly) were sold as loose beads to people who never said a word about them being used. Or if they did it was quickly covered up by a simple apology and reimbursement, and nothing ever is known about TEN MILLION TIBETAN USED ITEMS sold as “new without tags”. In most cases the items are lightly used, so it is estimated there were far greater numbers that were confiscated, but much of it was sorted and thrown out &/or resold to Tibetans and only the best was put up for sale internationally. 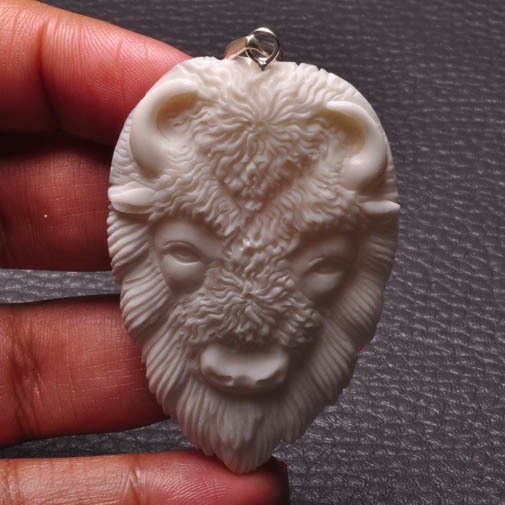 Though the seller says this yak ring is sterling silver and brand new, it is very questionable. Most of what the Chinese call sterling or steel is in fact silver plate over copper, and very few of the rings for sale are actually new. 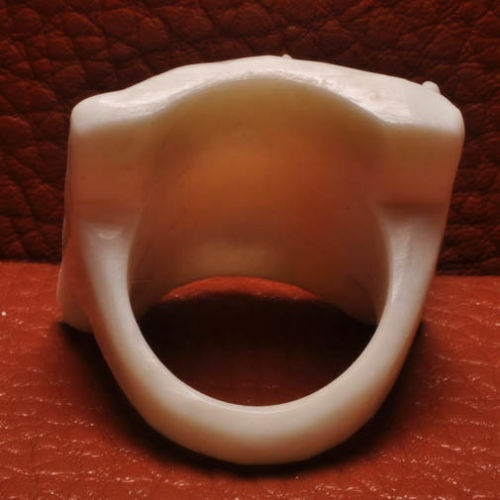 See the discoloration on the inside of the ring below. Old symbol of the Tibetan tribes &/or spirit animal. Also seen quite frequently on the ends of flutes and handles of metal vessels. 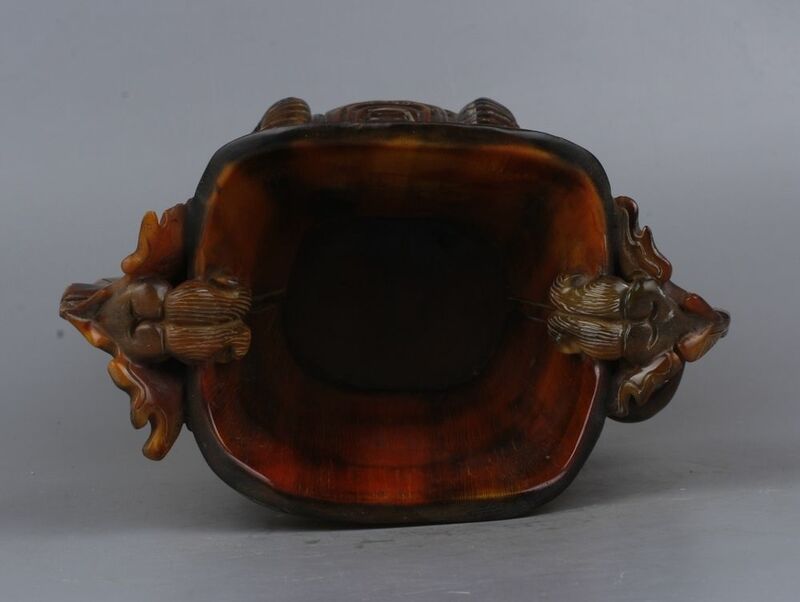 Wolf rings made of yak horn are also very popular and are considered a symbol of wild people outside of the Great Wall of China such as Mongols as far as I know. 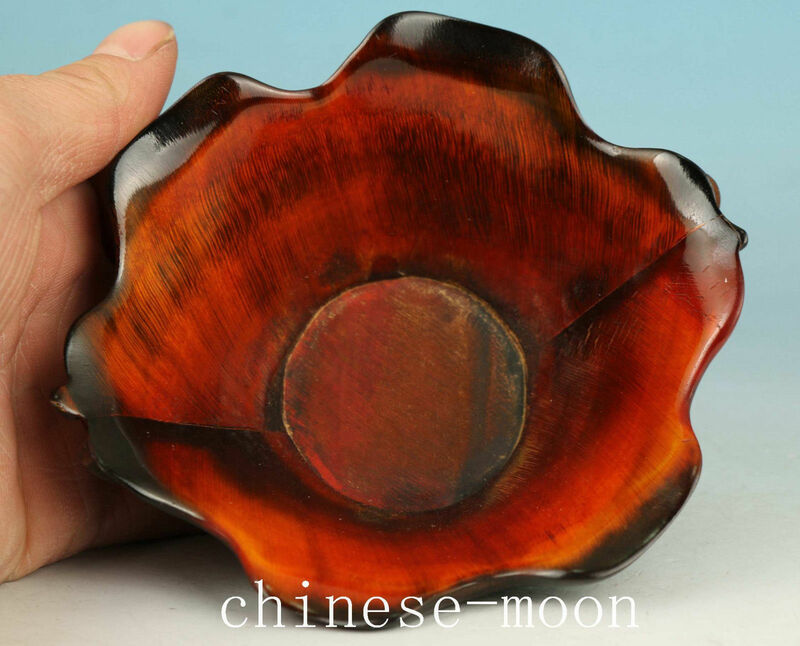 As you can see by the naming convention followed above: “Chinese” followed by the “-sun” and “-moon” for a name, as well as the same type face and size used for watermarks on the photographs and the same backdrops, these are all being sold by the same person or group of people selling these items. 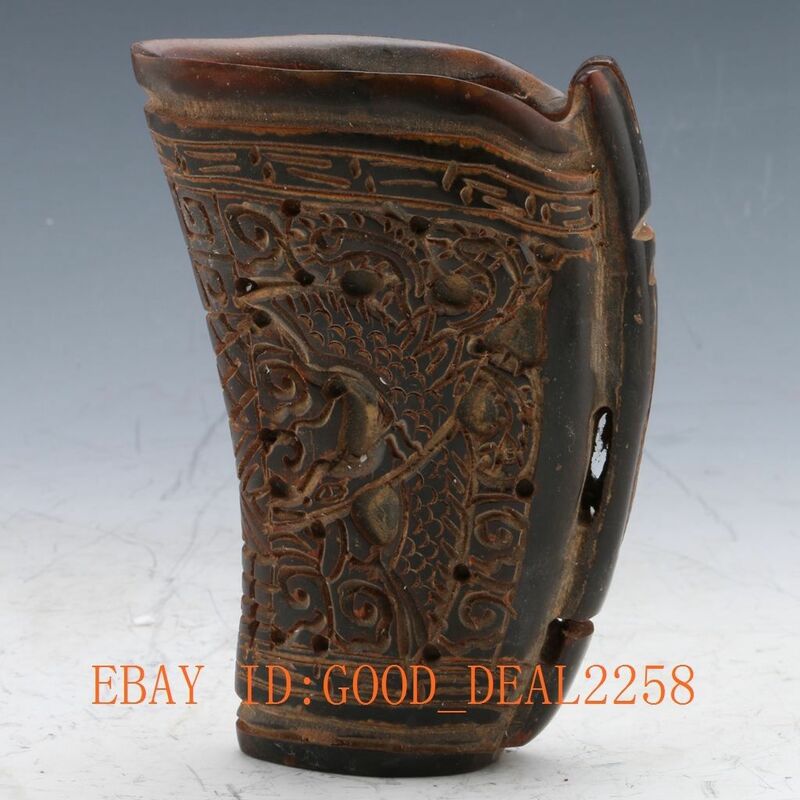 It is doubtful at these prices that if a legitimate Chinese antique dealer wanted to sell on Ebay, they would be able to compete and make a living. Having the market flooded makes their goods less valuable to a limited number of consumers. These types of skull toggles a very sacred. 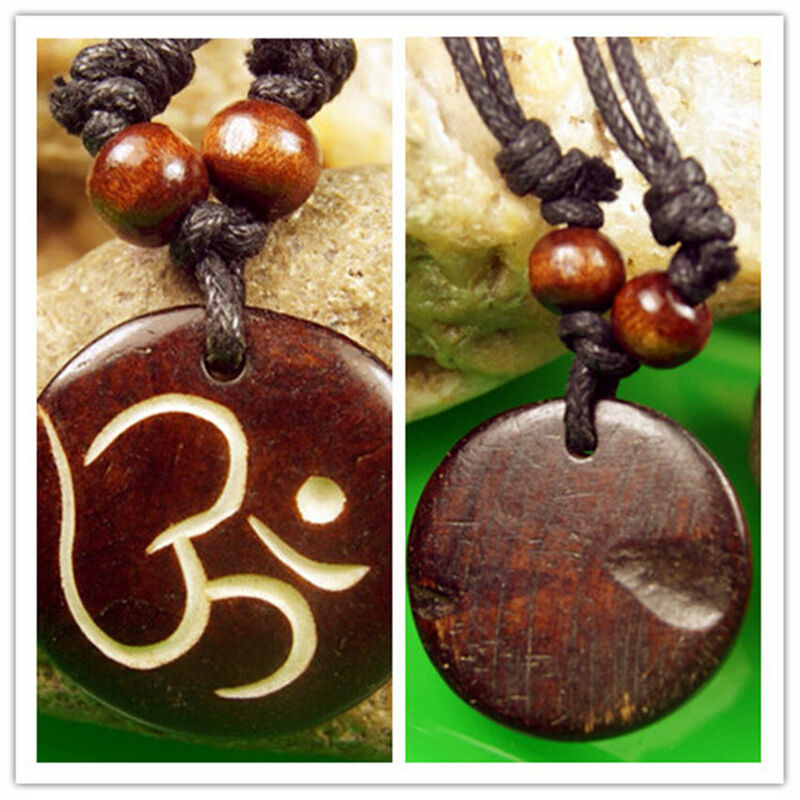 They are called “guru” beads, as they are special and used to tie the ends of of prayer beads (Buddhist malas) with. 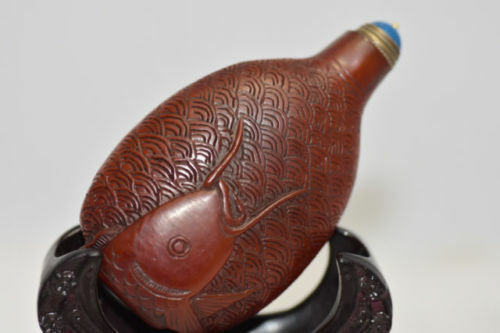 Carp snuff bottle made from carved yak horn. The word for “fish” is “yu” in Chinese and is a homophone for “abundance” and “affluence”- properties you always want your opium bottle to possess. Two fish represented together are also known as one of the 8 auspicious Buddhist symbols. Because all these snuff bottles are very old and also from Tibet, the chances of these just all coincidentally falling into Chinese hands who all use the same photographs over and over again are very astronomical. Like completely improbable, particularly since they are also considered to be drug paraphernalia, and might be owned, but hidden to this day because of the likelihood of persecutions, imprisonment and possible death. As previously stated, some of these sculptures could be ox, not yak, like the very ornate Chinese carving above.